The song that changed it all for me! I am not sure when it was exactly but it would have been sometime after 10th January 1989 because that was when “One” by Metallica was released. I was not quite 16 an very early in my guitar playing career, but what was about to happen would have a profound effect on me. I was watching Top of the Pops, for lack of anything better to watch. I don’t remember there being anything of interest on it, in fact I think I was probably pretty bored, but then the video to “One” came on. From the initial clean tone guitar intro, through to the machine gun like kick drum and distorted guitar riff this was the song that changed my guitar playing life. “One” was the third and final single from Metallica’s fourth studio album “…And Justice for All”. It was the band’s first top 40 hit single, reaching number 35 in the US Billboard chart, and also went onto win a Grammy in 1990. 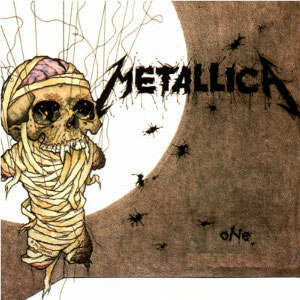 However, forget all the awards, for an impressionable 15 year old “One” by Metallica remains a monumental moment of guitar genius.